The University of Würzburg did not ignore the Open Letter in support of my journalism, and has concluded its internal investigation into medical and scientific activities of their trachea transplanters Heike and Thorsten Walles, without finding any misconduct. This was however not the end of it. I was invited to appeal this decision in front of the commission, which I did on March 6th 2017. In the end, the medical “external consultant”, Roland Jahns (specialist in inner medicine from the University Clinic of Würzburg) was catapulted out of the commission after insulting me as “pseudoscientist” and the entire investigation will be re-opened, with a new consultant to be recruited. The main reason: a newly emerged wealth of evidence of gross data manipulations in the papers by Walles, which readers of my site posted on PubPeer just when I arrived in Würzburg to give evidence. During my discussion with the Standing Commission for the Investigation of Scientific Misconduct of the University of Würzburg on March 6th, I was also told that the commission does not see my original text, for which I am facing a court trial on March 16th, as factually wrong. All information provided there was deemed correct except of one aspect: my readers were said to be led to misunderstand that the trachea transplant operations took place in Würzburg (while they happened in Stuttgart). The commission made clear that their university does not want to be associated with these transplants. They did however admit that the misunderstanding arose because Walles themselves have been placing such false information in media (including this recent article in the Siemens magazine), and even on the University of Würzburg website. The commission however assigned to me the responsibility of checking in advance the truthfulness of such obscure sources. The Commission report from February 20th 2017 is available here, there is also a German version. I was also able to find out some unpleasant details about the last two of Walles’ patients who received a pig-intestine-based trachea transplant, which I will report in my next article. Here, I will present the newly emerged evidence for gross data manipulation in the Walles publications. Originally, the Commission examined one image duplication in the Walles papers (Linke et al 2007 and Schanz et al 2010), which was previously reported on my site. There, a so-called “artificial liver” was presented (an award-winning and media-celebrated Walles technology which apparently led absolutely nowhere). The older paper reported pig liver and endothelial cells grown on pig intestine, the younger paper human liver and endothelial cells grown on pig intestine. The image showing these “artificial livers” was the same though, only zoomed in. Walles in fact admitted that the duplication happened intentionally, because they were allegedly in this way quoting their own work on a pig model. The experimental method section of the Schanz et al 2010 paper was quite clear that only the human model system is being presented, except that Walles did drop some nebulous mentions of an additional “porcine model” in the result section. Left, human “artificial liver”, right: pig “artificial liver”. Originally reported on my site. “The article published in 2010 refers to preliminary work documented in the publication of 2007. To avoid misunderstandings, it would certainly have been preferable to explicitly reference the first publication again within the caption of the illustration. The fact that this was not done does not meet the criteria of scientific misconduct, however, and is considered negligence”. “Mr Jahns will withdraw from the work with the Commission, and has apologized for his comments not only to you, but also to me and the Commission. Also I can only regret the incident, especially since it in no way corresponds to the style of the Commission and also the spirit of yesterday’s hearing, which has been at all times defined by objectivity and respect. The Commission will take account not only of the accusations you raised yesterday, but will also examine the already investigated matter with the help of a new expert. I will inform you about the further course of the procedure and can only offer you at this point once again my regrets for this failure and the delays in the proceedings”. “Besides the strongly human-suggestive concept of BioVaSc, there is also nothing specific about human cells in the subtext to (C), which would have been a clear mis-statement (and then scientific misconduct). So, however, everything remains a bit “in the mist,” human and pig cells are mentioned as a system used, and the interested reader is allowed to guess what is shown. “This bioartiﬁcial vascularised scaffold (BioVaSc®) was populated with additional primary human cells (hepatocytes (HC) or intestinal epithelial cells) to create in vitro vascularised human tissue models”. However, I concur with Jahns that this is a relatively minor issue, but for a different reason. 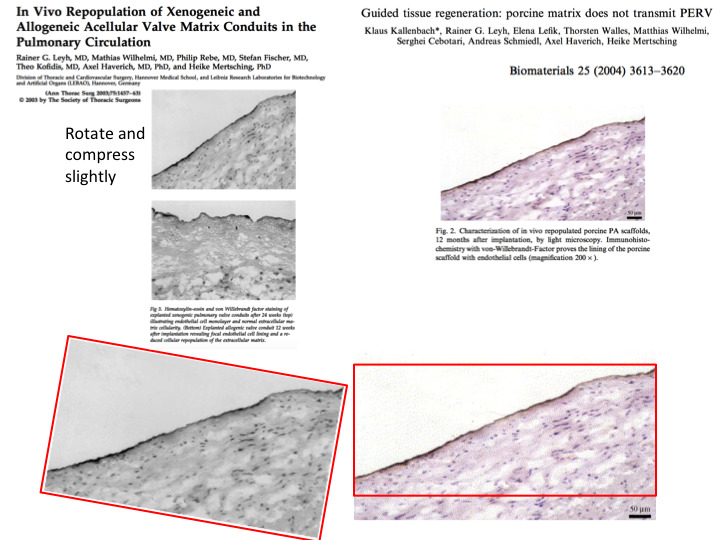 What my readers posted on PubPeer just when I was speaking in front of the Commission, shows much more outrageous data manipulations, in several publications. The only common authors on them are Heike and Thorsten Walles. Another common author occasionally is the patriarch of the Hannover Medical School (MHH), Axel Haverich (see my reports about his work on regenerative heart medicine here and here). Haverich was the Über-Boss of the Walleses and also, most prominently, of Paolo Macchiarini, when all three of them were still working on trachea regeneration in Hannover. Walles’ first pig-intestine-based tracheal transplant patient was also operated in 2003 together with Macchiarini (MacChiarini (sic!) et al 2004, Walles et al, 2004 see my report here), who as corresponding author on both papers was in charge of this experiment. Philipp Jungebluth, who is another trachea transplanter currently suing me in court (trial against me on April 6th 2017), studied at MHH at exactly that time and did then his medical doctorate under Macchiarini, with whom he later on transplanted several lethal plastic tracheas. Thus, Haverich’s huge laboratory for Biotechnology and Artificial Organs (LEBAO) at MHH was the German epicentre of some of questionable thorax regenerative medicine and trachea transplant technology at around 10-15 years ago. Because my reporting uncovered it all and much more, MHH press office has blacklisted me and ceased all communication. That German state’s office for data protection even openly advised the public university MHH not to release any Macchiarini-related information to me (since he is being illegally awarded adjunct professorship there, see my report). Thorsten Walles, Tanja Herden, Axel Haverich, Heike Mertsching, Biomaterials, 24 (2003). Klaus Kallenbach, Rainer G Leyh, Elena Lefik, Thorsten Walles, Matthias Wilhelmi, Serghei Cebotari, Andreas Schmiedl, Axel Haverich, Heike Mertsching, Biomaterials, 25 (2004). Kofidis T, Akhyari P, Wachsmann B, Mueller-Stahl K, Boublik J, Ruhparwar A, Mertsching H, Balsam L, Robbins R, Haverich A. Tissue Eng 2003 Jun;9(3):517–523. As usual, the journal Tissue Engineering Part A put the retraction notice behind a paywall, but it is available on PubMed. The paper was retracted “due to the discovery of multiple publications of identical data” from other three Haverich publications, none of which actually featured Walles. The Fraunhofer Institute in Stuttgart, where these latter papers came from and where Heike Walles and her above mentioned liver-designing first author Johanna Schanz still have their labs, seemed to be disinterested in the evidence when I alerted them to it. Instead, the Fraunhofer leadership apparently forwarded to Walles all my email inquiries about dead patients so she can use those in her court case against me. How much or rather how little Walles‘ prize-winning and excessively overfunded scientific legacy is worth now, in view of this evidence, is an important question for the re-opened Würzburg investigation to answer. But probably even more important is Walles’ worrisome attitude to patient safety and medical ethics. Please read about it in this article. If you would like to support my ongoing court defence against Walles’ (and Jungebluth’s) accusations financially, donation amount doesn’t matter, please go to my Patreon site or contact me. I think the Fraunhofer organization can learn a lot from the University of Wurzburg. Wurzburg appears to be handling this case in the proper manner and with respect. does not make sense considering the two different experimental setups. The problem is not a reference or copyright issue (negligent, but does happen on occasion). The problem is two different experimental results reported with the same image. I am reading this incorrectly? Yes, you read this correctly. 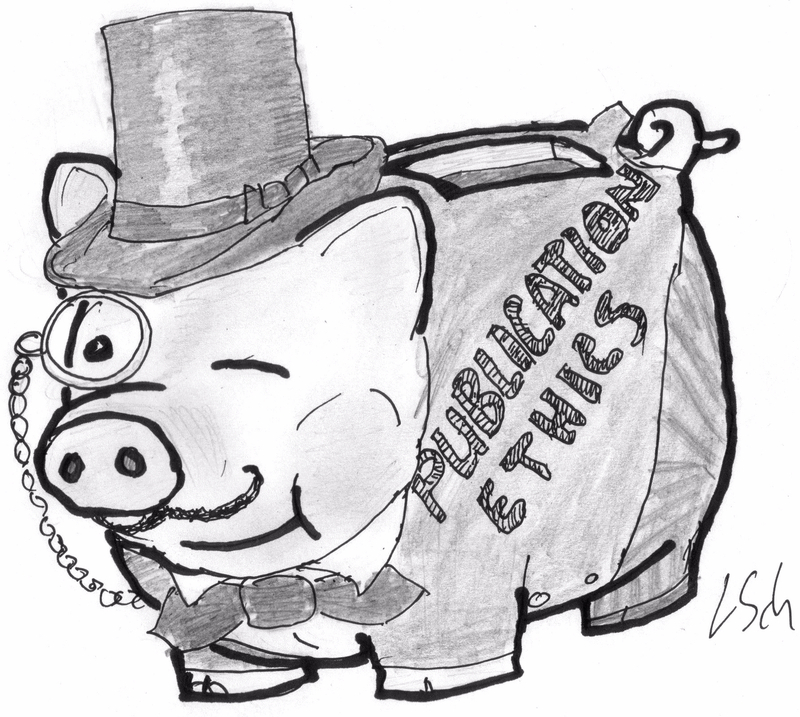 Basically, Walles claim that their mentioning of earlier pig experiments allows inappropriate and unacknowledged data reuse, now discovered in this paper at least one instance. In addition, I think it was inappropriate to appoint Roland Jahns to the commission as he is a member of the Comprehensive Heart Failure Center Wurzburg. Heike Walles is a member of the board of directors of the center. There appears to be a conflict of interest there. Isn’t it correct that three relevant operations were done in a time span of six years, and that the publication of the third operation referred to the success of an operation which was done a number of years before? Should we assume that in the long time period between the operations the Walleses did not anticipate to do a next operation, despite the success of an earlier one? I feel that the committee too readily agreed on “too late to carry out such tests”, and the discussion would have benefited from a broader context. A cynical person could argue that they knew the implant was toxic and would fail animal tests in the trachea position. It is much easier to further your career selling a couple human trials as successes than failed large animal trials. They would have had nothing to market themselves with. I don’t know anything about Thorsten Walles’ skill as a surgeon. He may be a great surgeon who would have done quite well without the trachea research. Heike Walles’ publication record is extremely weak, particularly for someone who leads a university institute and a translation center. A generous person could argue that they never received funding to do the large animal trials, but that would be hard to believe considering that they had already performed at least two human trials. I would assume, maybe falsely, that the German funding agencies would fund such trials. Someone may correct me, but I understand that the German compassionate use legislation of the time was based on the law for “Rechtfertigender Notstand” (justifying emergency situation) https://de.wikipedia.org/wiki/Rechtfertigender_Notstand. For this principle it is said that application should be “angemessen” (appropriate), and one of the critical questions concerning “angemessen” is apparently whether there is a “Vorwerfbarkeit der Notstandssituation” (responsibility/blame for the emergency situation). If in a six year period no animal experiments were done, wasn’t there some responsibility for the emergency situation of having to do an operation without prior knowledge from animal experiments? Unless the Commission has a deep understanding of these matters, they really might prefer to be more careful in addressing the legal issue. The remark by Jahns about the discussed work of the Walleses as “Das deckt sich mit unserem Eindruck chronisch schlampigen Arbeitens”, in which he appears to give his impression of the consensus among committee members, is quite insightful. I mean, he obviously is no friend of yours, but at least agrees that very critical comments can be made about the work/reporting of the Walleses. Google says that translates to, “This coincides with our impression of chronically sloppy work”. A cynical person could argue that calling someone sloppy is considerably kinder and has far less consequence than saying they are guilty of scientific misconduct. In general, I would probably agree with that conclusion when looking only at the one incident. Now there are 4 or 5 incidents, which demonstrates a pattern of behavior, not sloppy work. The German “schlampig” is probably a slightly stronger condemnation than the English “sloppy”. Chronically “schlampig” might suffice as misconduct, depending on the details and on the rules of the institutes involved. You may try to get the trial delayed based on the new information. After all, the lawsuit says that it was importantly based on the statements of the plaintiffs, whose credibility is at stake here. It may be a good thing if the judge sees these apparent duplications. Has anyone contacted these journals? Maybe Mr. Schneider is saving that for his next blog? I now informed all journals mentioned above. Expect little. For example, Biomaterials did nothing at all so far about the many Macchiarini papers published there. It all depends on the editors. High impact journals tend to care more about their brand than scientific integrity. Biomaterials is by no means Nature and the other journals are pretty low in ranking. Editors also have relationships with authors and may or may not want to protect the scientists or even the field of research. Some editors don’t want to be bothered by it. The blots are an obvious problem. The copy and paste job was so terribly done that anyone can see it. It will be very hard to ignore that away. The image duplications are the dumbest form of misconduct. You almost have to question the author’s general understanding of science and publishing. The journals have all been notified. The scientific community is watching and will be judging them and the research institutions where the possible misconduct occurred. To elaborate a bit on what I wrote before. At least several parties appear to agree that a few months after the operation on Patient No.3 a new law would have made the type of operation illegal. Law (interpretation) changes are often gradual, with in case of Europe first European guidelines and laws of common sense and good professionalism guiding the explanation of the older law versions. Has anyone attempted to contact any of the coauthors involved. We know from Mr. Schneider’s reporting that I. Dally has an intimate knowledge of the toxicity of the implant. When and who else was aware of the toxicity of the implant? Was the implant implanted into the last patient after the toxicity was discovered? The Fraunhofer organization can hide behind the operating hospital and claim they had nothing to do with the operations, but when exactly did Fraunhofer know the implant was toxic? They may not be completely innocent in this situation. I doubt Mr. Schneider will ever get a clear answer from the Fraunhofer organization. Both Dally and Steinke threw down the phone on me. Some days later, the letter from Walles lawyer arrived and the farce started. I think it is now obvious why the letter arrived. Call it the Lance Armstrong strategy. Destroy anyone that questions you. Try to stop every notion of misconduct in its tracks. I think the family Walles is going to regret the lawsuit. They will be found non-guilty on the surgeries, but will suffer consequences due to the publication discoveries, which would have probably never come to light had they not hired an attorney, attacked a journalist and upset the community. It may be debatable whether the compassionate use law could be correctly applied to all of the three operations. Potentially, less legal debate may be possible if patient No. 3 was informed about REPRODUCIBLE GOOD RESULTS as suggested in the Steinke et al. 2015 article. Namely, in the section which is called “Patient history”, the sentence describing these “reproducible good results” is immediately followed by a sentence about “patient education and informed consent”. The organization of this section suggests that the “reproducible good results” were part of that patient education. Now both Thorsten Walles and Jahns declare the operation in patient No. 2 as failed, with Jahns specifically saying that patient No. 3 needed not to know about this. So the commission may have a task to clarify in detail what the patient education entailed, because if he was educated about “reproducible good results” there may be a legal issue. Although Jahns has left the discussion, an interesting question to him would be that if pre-existing inflammation in patient No. 2 was sufficient for immune rejection of the graft, why was grafting done in the first place? And if the level of inflammation was not expected to automatically lead to rejection of whatever graft, how can the possibility that the graft itself induced that inflammatory rejection be denied? Isn’t it rather true that the combination of possible immune reactions in different patients should be part of a patient education? Last but not least the question, if it all worked so well and problems were never encountered, why hasn’t it become a standard method yet? With reproducible good results in humans already, it can’t be that hard to pass the legislative bars for doing the appropriate animal experiments etc., or can it? What you write makes perfect sense. The problem is that many authorities in Europe look the other way when doctors kill patients. No one cares about old patients or patients that are about to die. They make perfect experimental animals. When you read Mr. Schneider’s facebook account of the proceedings, he writes that Thorsten Walles considered all of the operations a success, despite the fact that the patients either died or suffered afterwards. He did not find the patient’s death scientifically relevant and therefore did not need to be published. This is a perfect example of why people should always get a second opinion before doing any sort of invasive procedure. You cannot trust doctors to make decisions in your best interest. There are many doctors who are more interested in furthering their careers than saving your life or allowing you to die with dignity. It is better to poke and prod you to death than let you pass away in peace. Mr. Schneider is fighting an entire health care system and legal system designed to protect doctors, not patients. I do not see any remedy for the 3 dead patients because the system does not care. On the other hand, the scientific community does care. There are many more scientists that care about proper scientific conduct than there are doctors that care about patient care. The brotherhood of doctors will protect itself over patients, every time. I predict that both Heike and Thorsten Walles will be found guilty of scientific misconduct on one, if not a number, of publications. The punishment for the misconduct may be a 3 year ban on DFG grants and a couple retracted/corrected papers, but that will be it. They made their careers on the lives of these 3 people. The Walles’ lives will go on. Have you sought aid from some human rights group like PEN for your legal troubles? They are only active in the UK but might still be interested due to the involvement of UCL in the trachea scandal. Is there any similar German organization? The Commission says “Dass den Eingriffen kein Studiencharakter zukommt, ergibt sich schon aus dem großen zeitlichen Abstand, in dem die Eingriffe durchgeführt wurden”. That means that the operations had no study character, which appears to be important for being allowed under the compassionate use law. But how about the biopsy at 2.5 years? Don’t these types of biopsies, especially if tissue samples with intact underlying vasculature are taken, always come with a risk? And what was the benefit for the patient? For seeing that the trachea healed at the graft site a biopsy may not have been necessary, and the biopsy at a nearby healthy site (Steinke et al. 2015) seems to have even less importance for the health of the patient. If there is any specialist reading this blog, can he/she take a look at the Steinke et al. 2015 paper, and explain whether those biopsies carried any risk and whether they were possibly beneficial for the health of the patient? What are the conditions under which such biopsies are allowed?